EMSOW features available to you depend on your role in the system (e.g. reading doctors usually have access to Physician Portal only). The Groups module allows your administrator to control and modify permissions for user groups. To open the module, sign into your account on your EMSOW site, click ADMIN in the upper navigation bar and click GROUPS in the drop-down menu. Add new – click this button to add a new group. In the window that opens fill out fields with information about the group you need to create. Type the Name, select Permissions, Default shell modules and the Maximum sessions number if it is necessary to limit it. By default the number of sessions is unlimited. You can add and remove Permissions using the buttons with arrows. The Default shell modules option lets you specify the modules that will open for the users of the group automatically. 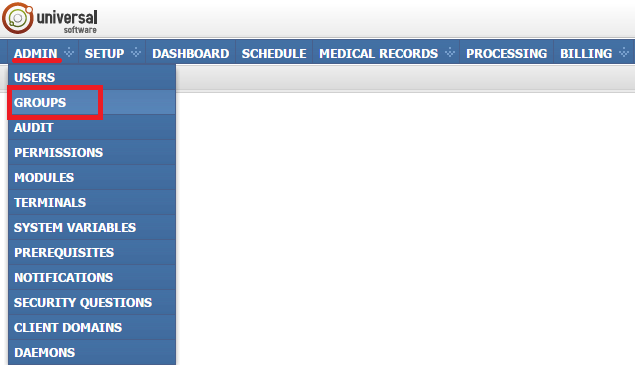 For example, you can select Physician Portal as the default shell module for reading doctors. Users cannot close the default shell modules while working in EMSOW. After saving the user group, it appears in the table with the corresponding properties. The Edit selected button opens the group editing window where you can make changes to the user group. Select the required record and modify the Name, Permissions, Default shell modules or Maximum sessions. You can add and remove Permissions using the buttons with arrows. Click OK to save the changes or Cancel to quit without saving. – For editing, there is as well another button in the rightmost column Actions. You can click it to edit the required user account without selecting it in the table. – For removing users, there is as well another button in the rightmost column Actions. You can click it to remove the required user account without selecting it in the table.